Building information modeling (BIM) is the digital representation of the 3D-based model process that is required for the architecture, engineering, and construction (AEC) industry. Building information modeling extraction is a process of using BIM software and other related software, hardware, and technologies in order to create and utilize a building information model. The software is implemented with the collaboration of all the staff and includes all the digital technologies that are used for designing, creating, and developing the construction models. BIM extraction software has led to digital transformation of the construction sector. BIM brings opportunities to countries that are expected to invest in developing new technological features in the construction field. Apart from 3D visualization, BIM also offers 4D and 5D frameworks, which comprises cost and project duration as well. The other features of BIM include representation of geographic information and properties of building components, especially in the field of architecture, engineering, and construction (AEC). It is anticipated that various industries are developing one standardized BIM model for the integration of different types of modeling systems in order to coordinate and communicate within the design-construction-operation team under one single platform. Key drivers of the market are the demand for feasible architectural and engineering solutions, increase in BIM implementation by companies across industries, and technological advancements in the construction industry. There has been a significant need for technological solutions for architects and engineers in the construction industry in order to design and plan effective and efficient models. Thus, building information modeling technology plays a vital role in developments within the architectural, engineering, and construction (AEC) industry. BIM extraction software provides sustainability for construction management for utilities, road construction, and scheduling and property management. Rising awareness regarding worldwide technological change has prompted project managers and designers to emphasize on the importance of efficient performance in the construction sector. Governments across various countries are investing in BIM technology due to the flourishing impact of the software on the markets. Another key driver for the adoption of BIM extraction software by clients and industries is the advantages that are shared by the client and the entire supply chain, which has a high impact on the development of commercial buildings. Utilization of BIM increases the collaboration within project teams, which proves to be impactful for enhanced profitability, better time management, reduced project cost, and improved customer/ client relationships. A major restraint of the market is the method employed for the integration of BIM technology by designers during the designing process. The market offers growth opportunities for SMEs of the construction industry in order to have long-lasting results in terms of revenue and productivity. The BIM extraction software market can be segmented based on software, end-use, and region. In terms of software, the market can be classified into on-premise and cloud based software. Architects, engineers, and contractors are emphasizing on the usage of cloud-based BIM extraction software due to enhanced interaction & communication capabilities offered by these solutions across the BIM cycle. Based on end-use, the market can be segregated into water and wastewater, rail and transit, energy generation facilities, houses and apartments, factories and warehouses, educational institutes and commercial spaces, government buildings, dams, and others. In terms of region, the market can be segmented into North America, Europe, Asia Pacific, Middle East & Africa, and South America. North America is estimated to hold a significant share of the market due to strong adoption and penetration of BIM in construction and designing as well as the presence of prominent BIM extraction software vendors across the region. Europe and Asia Pacific are emerging markets for BIM extraction software. Key vendors operating in the global BIM extraction software market include Autodesk, Inc., AVEVA Group plc, Bentley Systems, Inc., FARO Technologies, Inc., Tekla Corporation, Safe Software, Inc., Vectorworks, Inc., Microsoft Corporation, Synchro Software, Nemetschek Group, PointCab GmbH, Gexcel srl, Assemble Systems, SierraSoft, Innovaya, ClearEdge3D, Inc., Leica, Geo-Plus, Technodigit SARL, and Trimble, Inc. The BIM extraction software market report provides analysis for the period 2016 – 2026, wherein the period from 2018 to 2026 is the forecast and 2017 is the base year. The report covers all the major trends and technologies playing an influential role in the market’s growth over the forecast period. It also highlights the drivers, restraints, and opportunities for the analysis of market growth during the said period. The study provides a complete perspective on the global BIM extraction software market’s evolution throughout the above mentioned forecast period in terms of revenue (US$ Mn). The market overview section of the report demonstrates market dynamics such as the drivers, restraints, and opportunities that influence the current nature and future status of this market, macro-economic factors, regulations and policies, BIM lifecycle, ecosystem analysis, Porter’s Five Force Analysis, and PESTEL analysis of the market. Further, macro-economic factors included in the report provide key regional socio-political-technological developments and their impact considerations. A market attractiveness analysis has been provided for every segment in the report, in order to provide a thorough understanding of the overall scenario in the BIM extraction software market. The report also provides an overview of various strategies adopted by the key players present in the market. The report segments the market on the basis of components which are software deployment (on premise software, cloud-based software). On the basis of end use industry, the market is segmented into water and wastewater, rail transit and aviation, energy generation facilities, roads, bridges, and highways, houses and apartments, factories and warehouses, educational institutes and commercial spaces, government buildings, dams and others. The report provides in-depth segment analysis of the global BIM extraction software market, thereby providing valuable insights at the macro as well as micro levels. Additionally, the report comprises a competitive scenario and trends in which the BIM extraction software market concentration rate, mergers & acquisitions, and expansions undertaken by companies are provided. The report also highlights the competitive landscape of the global BIM extraction software market, positioning all the major players according to their presence in different regions of the world and recent key developments initiated by them in the BIM extraction software market. The comprehensive BIM extraction software market estimates are the result of our in-depth secondary research, primary interviews, and in-house expert panel reviews. 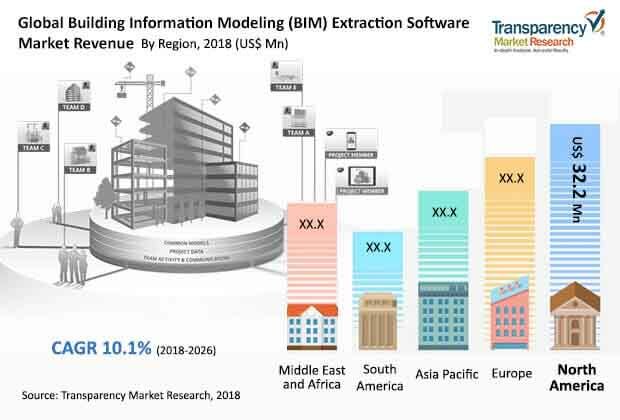 These market estimates have been analyzed by taking into account the impact of different political, social, economic and technological factors along with the current market dynamics affecting the BIM extraction software market growth. This report provides all the essential information required to understand the key developments in the BIM extraction software market, and growth trends of each segment and region. It also includes basic overview, sales area/geographical presence, revenue, SWOT analysis, and strategy and developments under the company profile section. Also, the report provides insights related to trends and their impact on the market. Furthermore, Porter’s Five Forces analysis explains the five forces namely buyers bargaining power, suppliers bargaining power, threat of new entrants, threat of substitutes, and degree of competition in the BIM extraction software market. This report also provides a comprehensive ecosystem analysis of the BIM extraction software market. It explains the various participants including BIM software vendors and BIM extraction software vendors within the ecosystem of the market. The research methodology is a perfect combination of primary research, secondary research, and expert panel reviews. Secondary research sources such as annual reports, company websites, broker reports, financial reports, SEC filings and investor presentations, national government documents, internal and external proprietary databases, statistical databases, relevant patent and regulatory databases, market reports, government publications, statistical databases, World Bank database, construction projects by region & end use industry, and industry white papers are referred. Primary research involves telephonic interviews, e-mail interactions, and face-to-face interviews for detailed and unbiased reviews on the BIM extraction software market, across geographies. Primary interviews are usually conducted on an ongoing basis with industry experts and participants in order to get latest market insights and validate the existing data and analysis. Primary interviews offer first-hand information on important factors such as market trends, market size, competitive landscape, growth trends and outlook etc. These factors help to validate and strengthen secondary research findings and also help to develop the analysis team’s expertise and market understanding. Moreover, the data collected and analyzed from secondary and primary research is again discussed and examined by our expert panel. The research study includes profiles of leading companies operating in the global BIM extraction software market. Some of the key players profiled in the market include Autodesk, Inc., AVEVA Group plc, Bentley Systems, Inc., FARO Technologies, Inc., Tekla Corporation, Safe Software, Inc., Vectorworks, Inc., Microsoft Corporation, Synchro Software, Nemetschek Group, PointCab GmbH, Gexcel srl, Assemble Systems, SierraSoft, Innovaya, ClearEdge3D, Inc., Leica, Geo-Plus, Technodigit SARL, and Trimble, Inc.